The M5Q90 tangential milling cutter from Sandvik Coromant is fitted with PCD tangential inserts that are said to provide a smooth and stable cutting action to lower power consumption and eliminate vibration. Photo courtesy of Sandvik Coromant. The cutting-tool and tooling-systems specialist Sandvik Coromant reported that it is introducing its M5Q90 tangential milling cutter to boost the first-stage roughing operation on newly cast aluminum parts for the automotive industry. Designed to complete “cubing” (first machining of faces after casting) in a single operation without creating burrs, the new tool is fitted with PCD (polycrystalline diamond) tangential inserts that are said to provide a smooth and stable cutting action to lower power consumption and eliminate vibration. The concept ensures reliable performance, improved tool life, exceptional surface finish, high metal removal rate, and an increased number of parts per insert, according to the manufacturer. “To enhance efficiency, our new M5Q90 tangential milling cutter features fully engineered cutter bodies matched with dedicated PCD insert geometries that feature a positive cutting angle to reduce cutting force and load on the machined component,” said Emmanuel David, global automotive product manager at Sandvik Coromant, in a press release. The M5Q90 cutter bodies are designed according to customer specifications and meet the requirements of high-productivity machining, Sandvik Coromant said in the release. The tool can operate in high-speed conditions in excess of 20,000 rpm. However, all cutter bodies offer the same design of tip seat, coolant channel, lead angle. and rake angle. Inserts are always kept in stock, the company said. 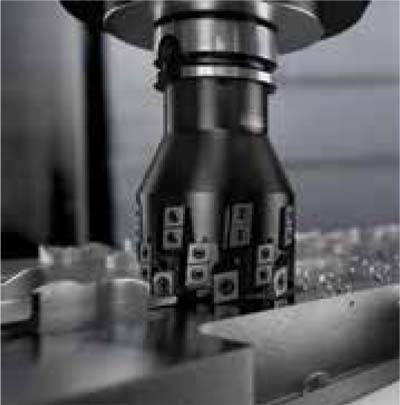 Sandvik Coromant (https://www.sandvik.coromant.com/en-gb/pages/default.aspx) said that tool life of the cutter body “can be further extended in engineered solutions with PCD inserts protected by rows of carbide inserts.” This configuration also serves to increase the depth of cut capability. 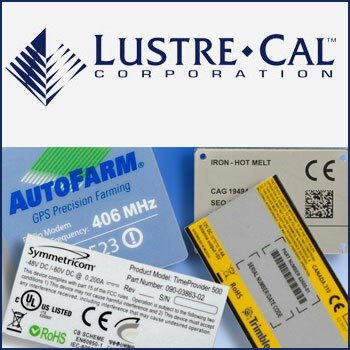 Although the basic tool with PCD inserts offers 2–4 mm (0.079–0.157 inch) depth of cut in full engagement, this can be boosted to in excess of 4 mm (0.157 inch) using the engineered solution with protective rows of carbide inserts, the company said. Aluminum cylinder heads and engine blocks, typically in automotive foundries or Tier 1 and Tier 2 suppliers, will be among the principal components to benefit, according to the manufacturer. As an example, the cubing operation on a cast cylinder head would involve machining the camshaft face, inlet/outlet face, and combustion face. Typical cutting data using M5Q90 might include a speed of 2,500m/min (8,202 ft/min) and feed per teeth of 0.20mm (0.008 inch). Users also benefit from high-precision coolant channels that provide the option for either emulsion or MQL application. The M5Q90 is one of several Sandvik Coromant tools for machining aluminum automotive parts. Capable of both face and shoulder milling, the M5Q90 is also said to be suitable for applications in the general engineering and aerospace sectors.